Last night’s Estimates timetable showed the Australian War Memorial was due to attend at 7.30 pm, but instead the Department of Veterans’ Affairs cleared their throats at that time and fronted Senators of the Foreign Affairs, Defence and Trade Committee. We checked by email with the committee secretariat and were told, ‘Earlier this evening the committee released the AWM from the hearing and therefore they did not appear’. This is, we understand, normal procedure when questions are lacking or time is pressing. It’s a shame the Memorial didn’t get a run. We might have heard an update on the progress of its planned $498 million extensions, and possibly reactions to the recent open letter and petition (both organised by Heritage Guardians) opposing this project. Instead, Memorial Director Brendan Nelson appeared on ABC Canberra News last night (mark 24.30), where newsreader Dan Bourchier introduced a clip of him being interviewed by Adam Shirley (radio mornings announcer) earlier in the day (from mark 5.00 for 20 minutes). Bourchier quoted the Director’s characterisation of the signatories of the open letter as ‘intellectuals, academics and retired public servants’, rather similar to the terminology Dr Nelson used with 2GB shock jock Chris Smith recently. Dr Nelson went on to misrepresent his opponents as wanting the Memorial to ‘close up shop’ and ignore recent conflicts. In his generously proportioned 20 minute interview we did not hear him mention, however, that his consultation program received feedback from only 134 individuals, compared with the 1236 people who signed the petition against the extensions. He [Dr Nelson] said that companies like Boeing (which makes warplanes and missiles as well as civilian aircraft) and Lockheed Martin (which makes the Trident nuclear missile as well as a range of other weapons systems) have no say in how their money is used. Nothing like that? Exhibit 1. The War Memorial’s theatre is the BAE Systems Theatre. ‘During the year a successful sponsorship agreement was reached with BAE Systems for the Memorial’s theatre’, says the Memorial’s Annual Report for 2008-09 at page 48. The agreement was renewed in 2013 and here is a picture of a wreath laying ceremony in the theatre in 2016. There is another picture of the theatre on the Memorial’s ‘Venue Hire’ page, in which the BAE Systems logo appears in a place of honour above the War Memorial logo. BAE Systems’ name also appears in large letters above the door of the theatre, so those who enter have no doubt whose largesse they are enjoying. Exhibit 2. Steve Evans’ article said this, paraphrasing Dr Nelson: ‘[T]he money from weapons manufacturers was used carefully. It wouldn’t be used, for example, for the part of the memorial complex devoted to the great suffering of prisoners of war.’ Of course not; such a use of arms makers’ money would be inappropriate: prisoners of war might be in that situation because an enemy had made better use of manufacturers’ weapons than ‘our side’ did. But there is this from Senate Estimates in 2015: ‘Dr Nelson: … We got $500,000 from Lockheed Martin, which is enabling us to run a whole lot of educational programs’ (page 191). (Emphasis added.) Does that use pass the appropriateness test? Is it somehow more acceptable to spend money on education, including the education of children, than on displays about POWs? So an arms company picks up the tab for promoting the Memorial’s brand and a wide-ranging public program. And it gets an acknowledgement. Not naming rights perhaps, but a cosy relationship nevertheless. What’s in a name? What’s a name worth? These companies might not ‘insist’, but which of them would not expect some sort of recognition? (Part of the recognition for arms manufacturer Boeing was its President, Dennis Muilenburg, becoming a Fellow of the Memorial.) Is there any difference between having your name in the entrance foyer of the Memorial – as all of these donors do – and in the Memorial’s Annual Reports – as all of them do – and having ‘naming rights’? And that BAE Systems Theatre ‘sponsorship agreement’ looks very much like an example of naming rights. Perhaps the Memorial could release the paper work. 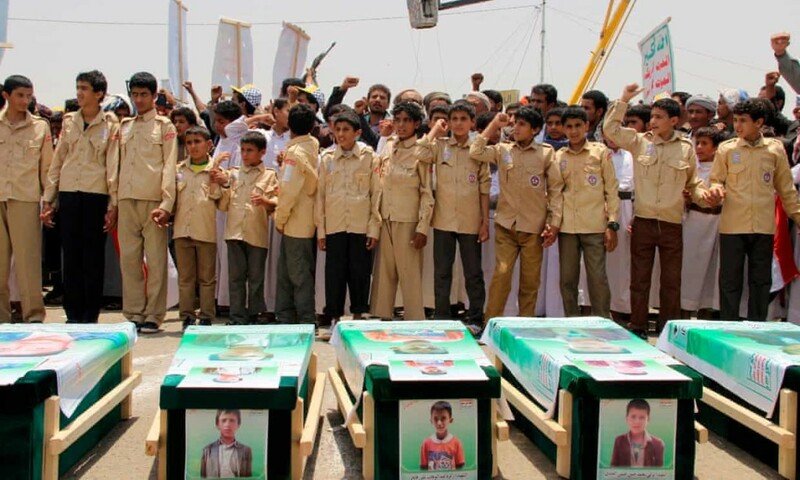 Regarding the Lockheed Martin money the Memorial spent on educational programs for children, Lockheed Martin also makes bombs that kill children in Yemen. (And so does BAE.) Then there’s that strange financing deal at the airport: we Australian visitors to the Memorial can see ‘we are young and free’, thanks to an American arms manufacturer. Once you delve into these cases, fancy dancing with the term ‘naming rights’ doesn’t really cut it. Had the Committee stuck to its original timetable last night, perhaps Senators could have asked questions about the naming game at the Memorial. The answers would have been interesting. * David Stephens is editor of the Honest History website, a member of the Heritage Guardians committee, which organised the open letter and petition, and co-editor of The Honest History Book (NewSouth 2017). Note: The authoritative SIPRI ‘league table’ shows that, by value of sales in 2017, Lockheed Martin was the world’s largest arms producer, followed by Boeing (second), BAE Systems (fourth) and Northrop Grumman (fifth). Raytheon (third) is also a War Memorial donor, as is Thales (eighth). Well observed and well examined. Arms manufacturers are examples of those parts of the economy which want to profit (tremendously) from less than admirable pursuits, gloss over how such profit is created, and then reach for compliments (from some) for using a small portion of such profit in creating more self-advertising. A self-serving round-about always with the aim of making more money from others’ misery. A more beneficial use of such money and much more (instead of giving it to the AWM) would be IF said companies gave funds directly to injured veterans support organizations AND to such groups as MSF, UNHCR and AI. In that way, they would be doing at least some good for people negatively impacted after coming into contact with the products produced by these companies.